The greatest cause of death due to infection globally is tuberculosis (TB). Two supercomputers – Comet at the San Diego Supercomputer Center (SDSC) at UC San Diego and Stampede2 at the Texas Advanced Computer Center (TACC) at the University of Texas at Austin – are being used to help combat this lethal disease. Researchers from the University of Michigan relied on Comet and Stampede2 to help them develop detailed models to better understand how TB spreads throughout the lungs. Their most recent findings, published in the January 2019 issue of Inflammation and Regenerative Medicine will also be featured in an upcoming special issue of Computational Modeling in Inflammation and Regenerative Medicine. The hallmark of TB infection is the formation of spherical structures in the lungs. These masses of infected tissue, called granulomas, start to form within the first two to four weeks. TB granuloma progression and its final outcome (clearance, containment, or dissemination) depends on an array of factors such as the speed of spread and whether the immune response in the lungs is able to clear the infection. One way that scientists are working to fight this often-fatal disease is by using highly detailed computer-based simulations to determine ways in which to treat the granuloma(s) before the bacteria harbored within them spread to surrounding tissue and organs, preventing any effective treatment. The mathematical and computational tool used to capture the complex dynamics of TB granuloma formation and progression is called agent-based model (ABM) and referred to as GranSim (i.e., Granuloma Simulation). 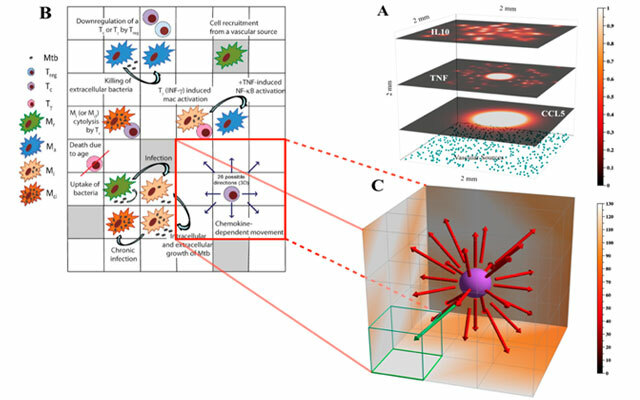 GranSim works like a virtual reality environment, where cells, bacteria, and molecules are represented by various agents of different pixel sizes in an abstract 3D cube. The cube captures a section of the lung where granulomas typically form. Sources in the cube mimic lung vascularization and, depending on certain concentration conditions for the molecules modeled, allow for recruitment of cells upon an initial seed of infection. Cells move around following molecular concentration gradients. Bacteria can infect cells and proliferate inside them. Cells can either kill bacteria or become infected and die if they harbor too many bacteria, setting up a chain reaction for more infection. Granulomas can wall off the spread of infection and generate an environment that limits bacterial growth (see http://malthus.micro.med.umich.edu/lab/movies/Multiscale/3D-GranSim/ for 3D animations). This research was supported by the following National Institutes of Health (NIH) grants awarded to Denise Kirschner and Jennifer Linderman: R01 AI123093, U01HL131072, R01 HL110811. This research also used resources (e.g., Comet and Stampede) of the National Energy Research Scientific Computing Center, which is supported by the Office of Science of the U.S. Department of Energy under Contract No. DE-AC02-05CH11231 and the Extreme Science and Engineering Discovery Environment (XSEDE), which is supported by National Science Foundation (NSF) grant MCB140228.